MH370 Whats In The Cargo Hold? – footsteps……..
MH370 Whats In The Cargo Hold? Before this we were told that there is no dangerous cargo carried on board MH370 besides passengers luggage and was mentioned tons of mangosteen. MAS chief executive officer Ahmad Jauhari Yahya on 21 March 2014 denied the aircraft was carrying any hazardous goods and instead highlighted the “three to four tonnes of mangosteen” on the plane. Personal view: if the aircraft crashed why Blackbox does not transmit any pings. If it really crash in the sea/ocean why there are no debris from floating objects in the aircraft. So the aircraft might still be intact and “invisible” smewhere. My 2 cents. Stuff reports, “Forensic experts examining the home flight simulator of Malaysia Airlines pilot Zaharie Ahmad Shah have found nothing suspicious, collapsing the only significant lead investigators have been pursuing to try to solve the mystery disappearance of MH370, police sources say”. Intensive scrutiny of Zaharie’s background has failed uncover any links to extremists groups or terrorism. Investigations have also failed to find anything suspicious in the background of Fariq, who was due soon to marry another pilot. It was exposed by Telegraph, the last 54 minute communications between the aircraft MH370 and the control tower in the early morning of 8th March 2014, the day it went missing. 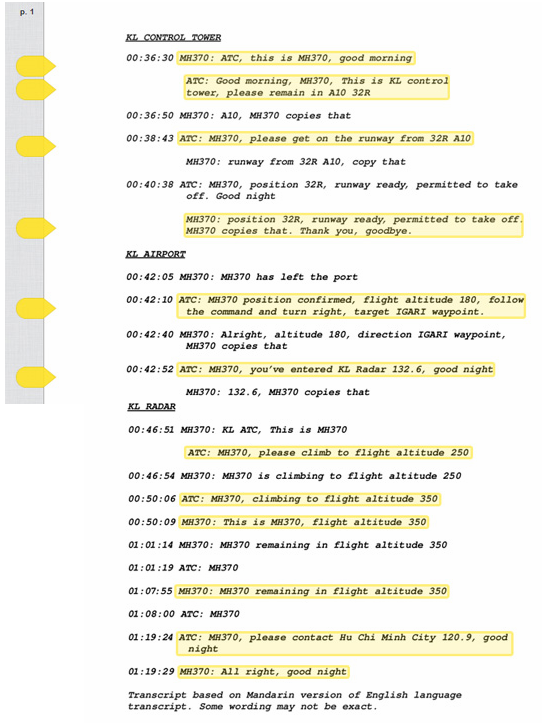 The exposed transcript was between the pilot, the control tower and other air traffic controller from 00.25 the time Boein 777-200ER take-off until her altitude reached thousands of feet above the South China Sea. The messages contained general orders fro the air control tower to the pilot and the detail communication starts at 00.36hrs.